I feel like it’s not Easter Brunch without some kind of asparagus dish. Asparagus is one of my favorite spring vegetables, and we eat a lot of it. While this Lemon Garlic Asparagus Recipe is usually my go to Easter recipe, I thought it would be fun to try something new, and combine the dinner rolls and asparagus into one recipe. I actually got the idea for this when I was making my Prosciutto Wrapped Asparagus, and started thinking about what else I could wrap around asparagus. Since puff pastry is made for wrapping around just about anything, I decided to give it a try, to great success. I started by whipping up a mixture of goat cheese, lemon juice, and fresh garlic. Although the asparagus puffs are cooked, the garlic is put into the filling raw, so I use a small amount. Too much raw garlic can end up really overpowering a dish, and I find it actually burns my mouth. Yes, that is the sad voice of garlicky burning experience you hear. Once I thawed my puff pastry, I spread it with the goat cheese filling, and sliced it into strips. Then I just wrapped a strip around each asparagus spear, brushed it with some egg wash, and topped it with a bit of fresh lemon zest. These were fast, easy, and quite impressive looking. 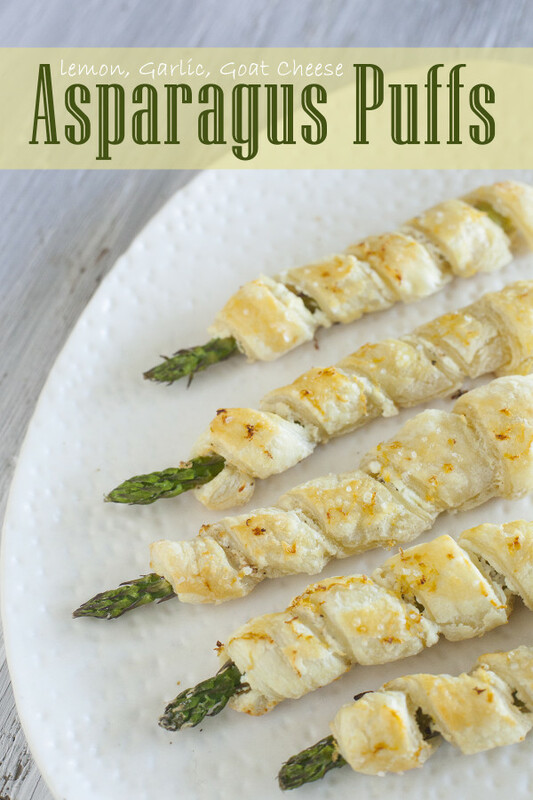 I have several asparagus recipes you can check out as you plan your Easter brunch, but this is definitely my current favorite. Do you have a favorite you can share with me? Feel free to link to it in the comments. 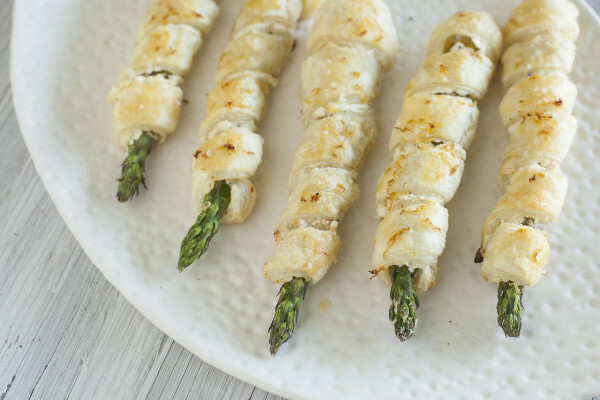 Tender asparagus is wrapped in creamy goat cheese, tangy lemon, flavorful garlic and flaky puff pastry for an impressive Easter brunch side dish. Trim asparagus (see How to Cook Asparagus). Let puff pastry sheet thaw, and spread out. Mix the goat cheese, lemon juice, and garlic. Spread evenly on the puff pastry sheet. Slice the puff pastry into 12 strips. I find it easiest to use a pizza slicer. 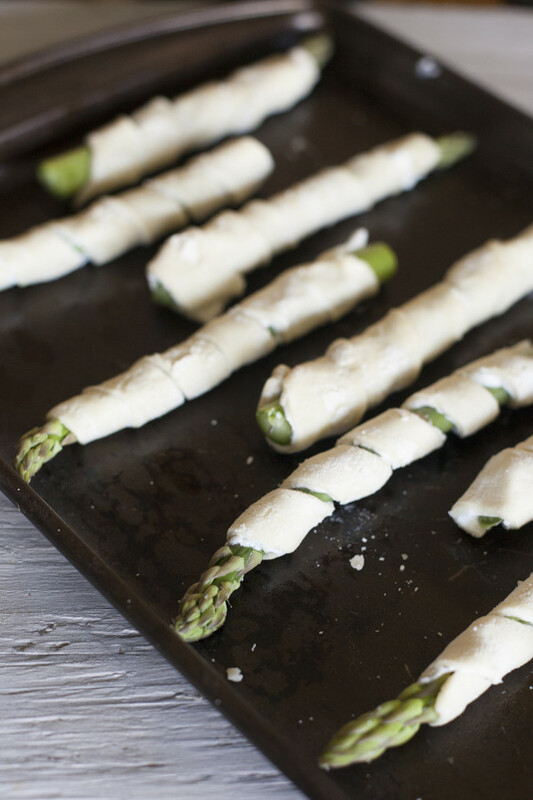 Wrap each strip, goat cheese side in, around an asparagus spear, and place on a baking sheet. Whisk the egg with a little bit of water, and brush some egg wash onto the top of each pastry wrapped asparagus. Sprinkle with a little lemon zest and salt. Bake 15-17 minutes, until pastry is puffed and golden. Best served hot. Approximate cost/serving: I save some money by not getting organic asparagus since they're not on the dirty dozen list. This ended up costing me about $4 for the 12, so about 33 cents a serving. Vegetarian/Gluten Free: This is vegetarian, though not vegan due to the cheese and egg wash. You can brush the pastry with some milk in place of the egg wash if you'd like. If you'd like to make this gluten free, try making your own gluten free puff pastry.